Posted June 15th, 2015 at 11:58 am. They reach for the sky, bend to the floor, and balance on one foot. 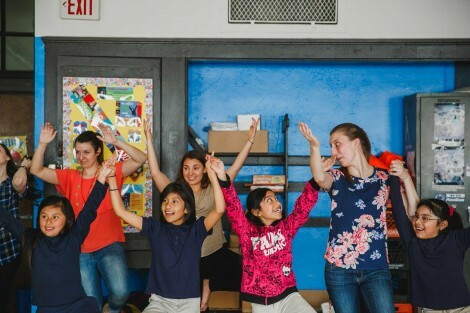 While the poses change, one constant remains, the look of joy on the faces of the children taking part in yoga exercises as part of Puentes Hacia El Futuro, the after-school tutoring and mentorship program run by the organization Puentes De Salud at a South Philadelphia elementary school. For the past two springs, Bryn Mawr and Haverford students enrolled in the Praxis Course Empowering Learners: Holistic Approaches to Education and Health have been doing their fieldwork with Puentes De Salud. Guiding the seven- and eight year-olds this spring were Colleen Cumberpatch ’15, Sarah Andrews ’16, and Haverford students Miriam Perez-Putnam ’16 and Elizabeth Rule ’17. Cumberpatch had been a tutor at Puentes for the past two years, and enrolled in the Empowering Learners course during her second semester as a tutor. Alexandra Wolkoff HC ’14, is also a veteran of the course. This year she ran the Hacia el Futuro program as a Haverford House Fellow, and she’ll be taking over as director of the program this summer after her fellowship ends. In January she began incorporating mindfulness — deep breathing exercises and mindful listening games — into the daily after-school routine for the first and second graders. Haverford senior Kathleen Tsai has also been part of the program for several years and this spring did a presentation at a conference held at Villanova on the experience. Taught by Education Chair Alice Lesnick, Empowering Learners explores the meanings of empowerment in educational settings with a focus on including the body, mind, spirit, and emotions in the design and practice of education. With holistic and culturally situated approaches and understandings, students gain tools for strengths-based work with individuals and communities. Next spring, the course will include a field placement at Ardmore’s Center for Creative Works, a studio-based vocational art program for adults with developmental and intellectual disabilities, among other field placements.